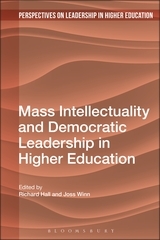 Working with 20 co-authors, Joss Winn and I have just had published Mass Intellectuality and Democratic Leadership in Higher Education. The edited collection forms part of Bloomsbury Academic’s series on Perspectives on Leadership in Higher Education. The abstract, key features and table of contents are noted below. Higher education in the UK is in crisis. The idea of the public university is under assault, and both the future of the sector and its relationship to society are being gambled. Higher education is increasingly unaffordable, its historic institutions are becoming untenable, and their purpose is resolutely instrumental. What and who have led us to this crisis? What are the alternatives? To whom do we look for leadership in revealing those alternatives? This book critically analyses intellectual leadership in the university, exploring ongoing efforts from around the world to create alternative models for organizing higher education and the production of knowledge. Its authors offer their experience and views from inside and beyond the structures of mainstream higher education, in order to reflect on efforts to create alternatives. In the process the volume asks: is it possible to re-imagine the university democratically and co-operatively? If so, what are the implications for leadership not just within the university but also in terms of higher education’s relationship to society? This entry was posted in Activism, Education and tagged activism, alienation, cooperative, curriculum, higher education, mass intellectuality, pedagogy, politics, university. Bookmark the permalink.